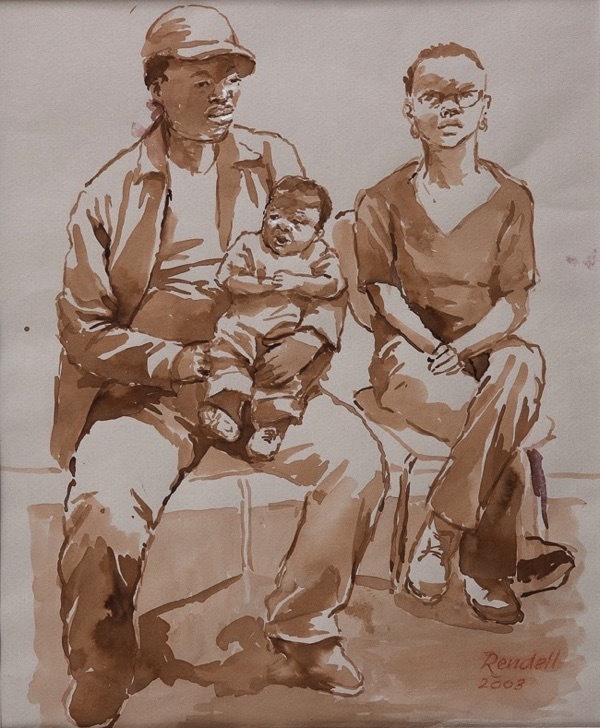 I feel touched and privileged to have been given the eleventh hour opportunity last year to interview Artist Dorothy Rendell who died yesterday. 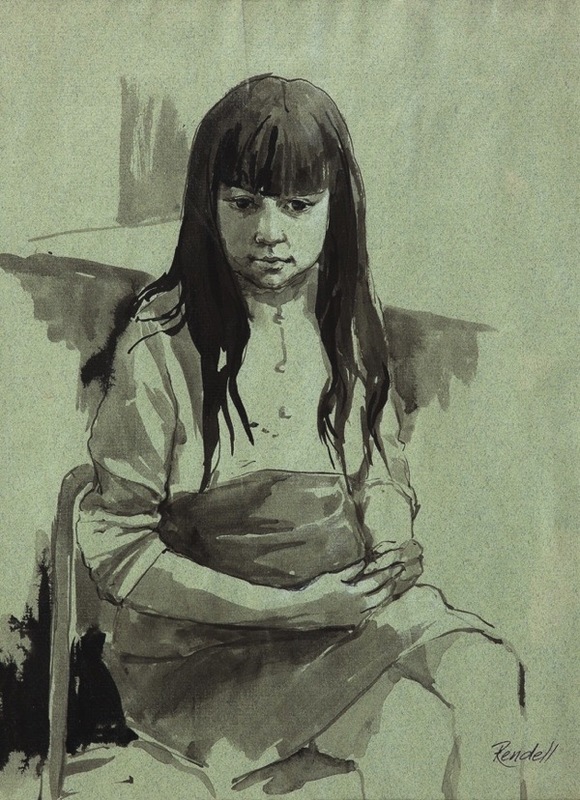 It is a matter of regret that she did not receive the recognition she deserved for her painting earlier in her life, yet I take consolation that she died with a copy of my interview at her bedside and she took great delight in the many appreciative comments she received for her work, regarding this late public acknowledgement as vindication of a kind. In recent months, I enjoyed visiting Dorothy Rendell to hear her stories, admire her paintings and share her company. At ninety-four years old, Dorothy was taking her ease, relaxing in the warm with a glass of red wine and a cigarette while contemplating the winter sunlight in the garden of her tiny cottage at Mile End Place. Blessed with magnificent cheek bones and a profile worthy of Edith Sitwell, Dorothy was a natural raconteuse who possessed the hauteur of another age, tempered by an endearing, caustic sense of humour. 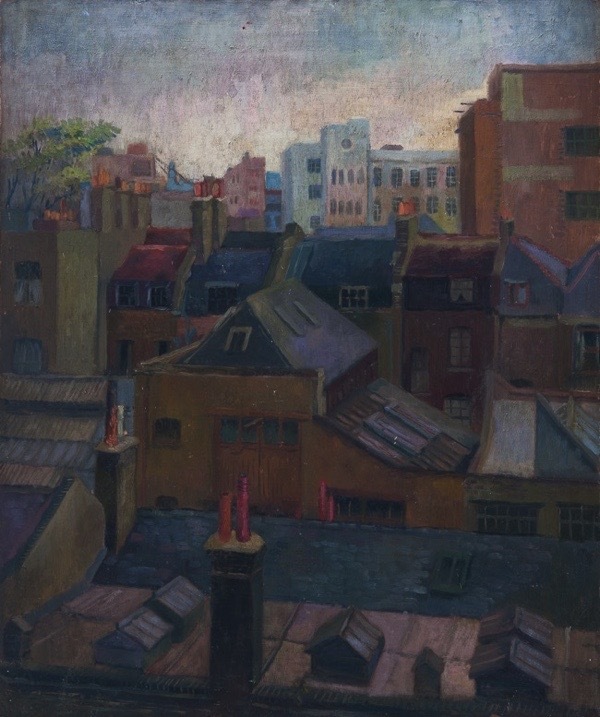 Studying at St Martin’s School of Art during World War Two, Dorothy began her career as an artist with a studio in Kensington where she encountered the likes of Henry Lamb, Carel Weight and Orovida Pissarro. 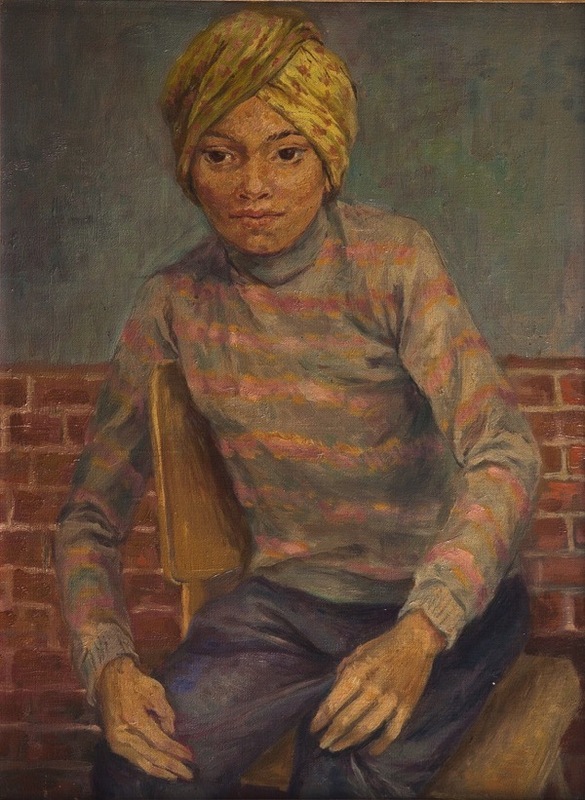 Yet it was in Stepney working for more than forty years at Harry Gosling School that she discovered the joyful expression of her abilities and here she undertook a series of portraits of pupils that spanned her career. 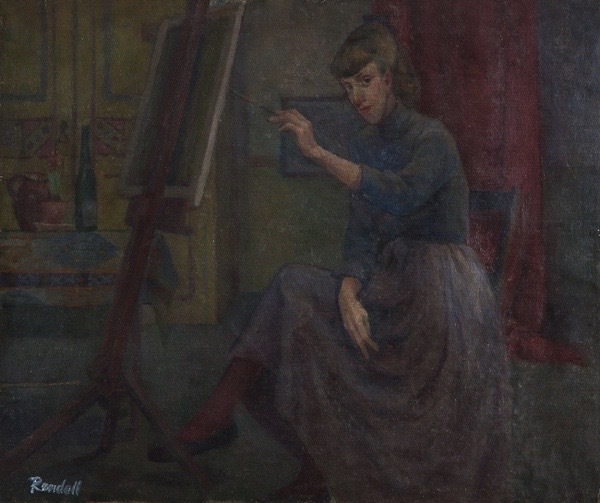 Just a handful of unexhibited oil paintings bear witness to a significant talent which might have made Dorothy famous if she had received the recognition she deserved. 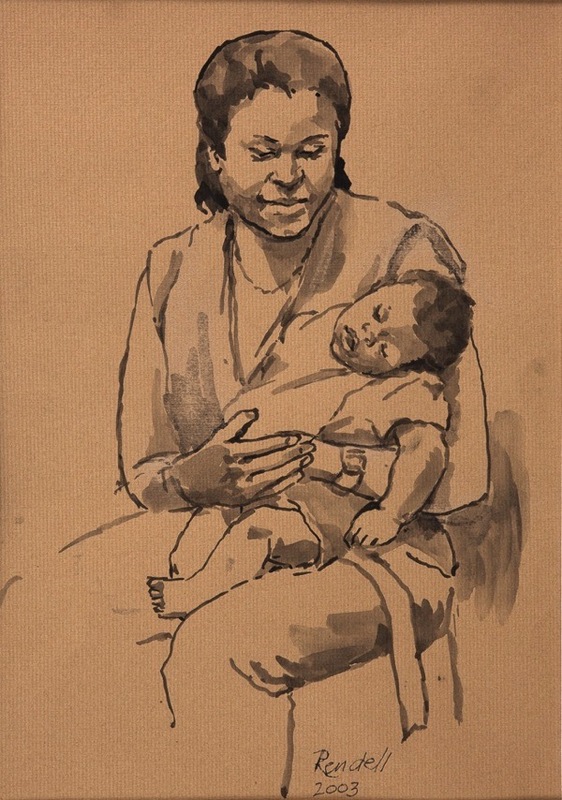 Instead it led her to the East End – by way of Italy – and ultimately to a modest life of fulfilment as an inspirational and passionate art teacher. “Very few people really say what they think and say it bluntly and openly regardless, they couch it round with tact, but I am not like that. At ninety-four, I do not belong to any age. When I think ‘fifty years ago today,’ it does not seem all that time ago to me. I had to give up my art work because I had no money and I could not find anywhere to paint. I had a huge studio at the back of a house in Warwick Gardens, Kensington, which was freezing cold and falling down, the rain would drip in. It had once belonged to Jacob Epstein. It was the most romantic studio. People used to love coming round and I had constant visitors. I used to paint there but I wasted an awful lot of time working to make money when I should have been painting. I exhibited at the Leicester Gallery and at the Royal Academy, but I never had a solo show. I just put things up here and there. I muddled through life really, but I have had an interesting life. I came to the East End because I could not get a job anywhere else, people were terribly against women artists. They still are in this country. I used to go for teaching jobs and I had very good credentials, including references from Henry Lamb, Vivian Pitchforth and Mr Dickie who was an Inspector of Schools, but I never got the job because some man would come along and swipe it. This used to infuriate me because I knew that I was better and I was better at teaching too. I never thought I would own a house and when I came to live in Mile End Place, people said, ‘You’re crazy, you’ve bought a load of rubble, but I think it’s marvellous!’ All of my life has been flukes like that. 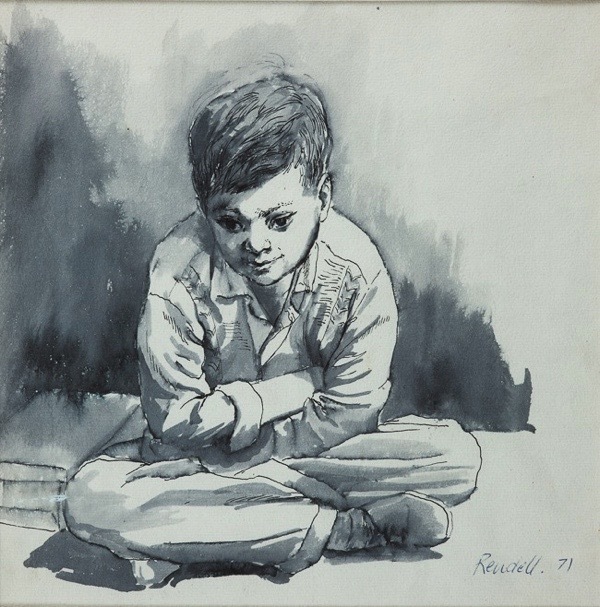 I started drawing very early on, at ten years old. Dorothy Rushforth, my mother, came from the north of England and went to art school, she was quite advanced for her time. My father came from a long line of gentleman farmers in Devonshire and he was a bit of a villain. His family lost all their money through one of them being a gambler. So he travelled the world on luxury liners doing doubtful business deals and brought people back and my mother had to entertain them and cook for them. They just frittered away their lives. 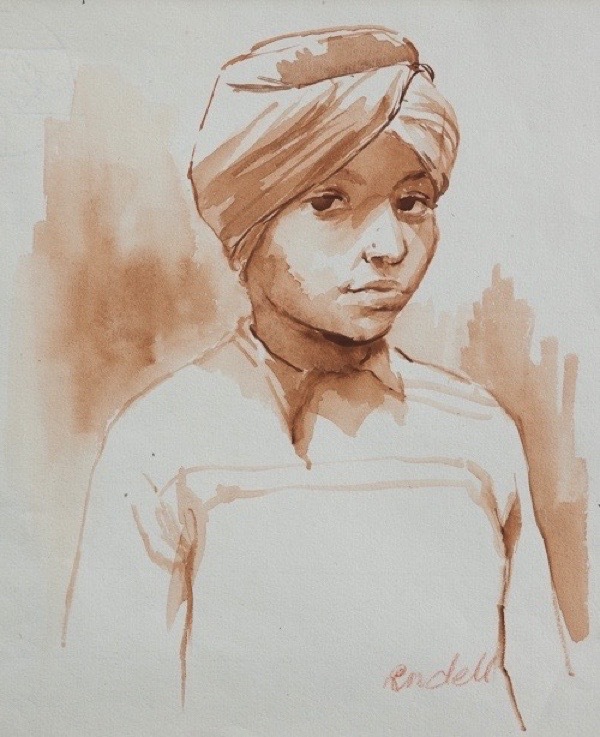 My mother encouraged me to draw and when I was eighteen I got a prize for the best artist in the school but nobody mentioned it and nobody took me to prize giving. It is most extraordinary when I think about it now! Of course, the war was on and one was whisked from here to there. I came up to London in wartime and I was by myself, I did not know a soul. I got one room in an attic in Pembroke Sq, Notting Hill Gate. There were lots of interesting people and a very good cinema there, with marvellous French films, I had never seen anything like them. It was exciting. Then I got into St Martin’s School of Art through doing evening classes because I had to work in the day to earn money. 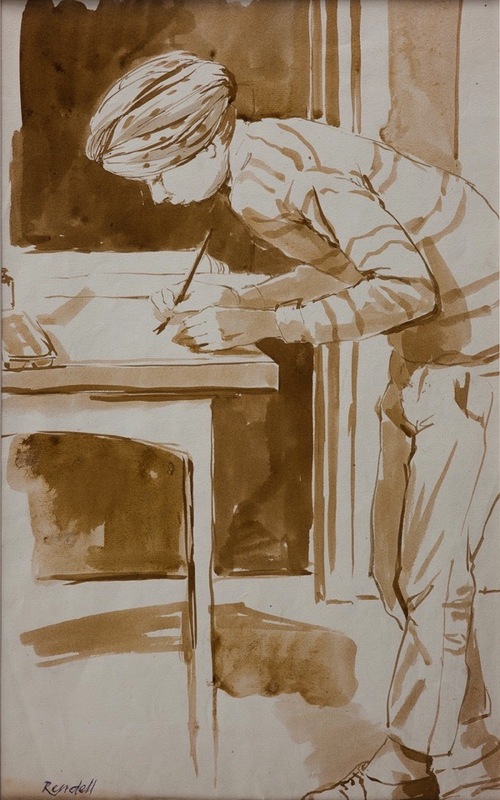 At art school, I met Vivian Pitchforth who was a well known draftsman and if you were taught how to draw by him, it was a great honour. Somehow, he noticed me. I do not know how because I never said a word to anyone. The art school was in Charing Cross Rd then, it was lovely. I inhabited all those dumps in Old Compton St where you got cheap meals for tuppence ha’penny. We all used to go to them, I am quite sure we were eating horseflesh! There were lots of little cafes, it was wonderful. 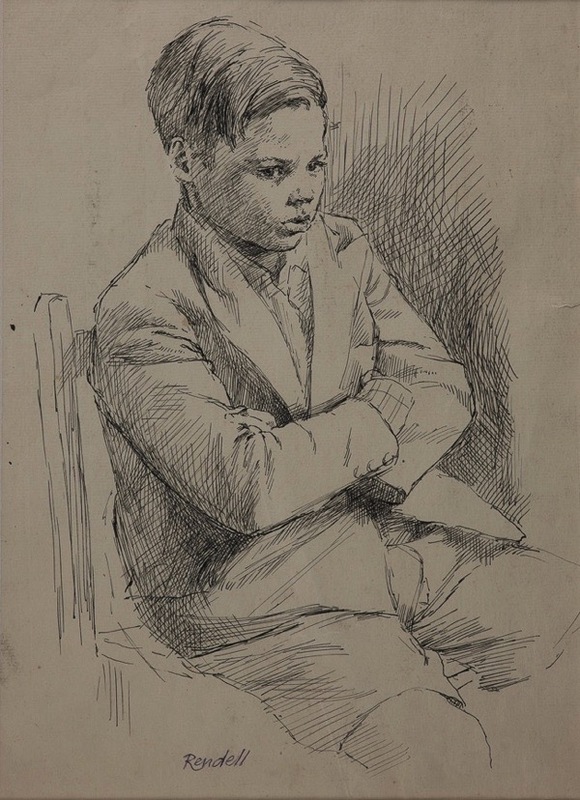 Robert Beulah who was a Royal Academician, his mother ran a cafe there and she quite liked me, she thought I was quiet and well behaved – so we had a little clientele there. It was very good. I loved my years in Soho, living in that awful attic in Notting Hill Gate which is probably worth a fortune now! How life changes. 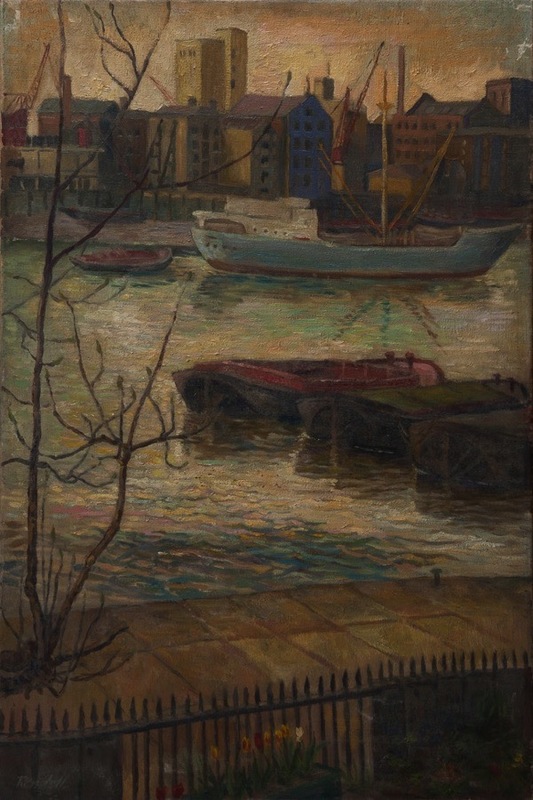 I met Henry Lamb, the artist, and I thought he was marvellous, he was very quiet and very scholarly. 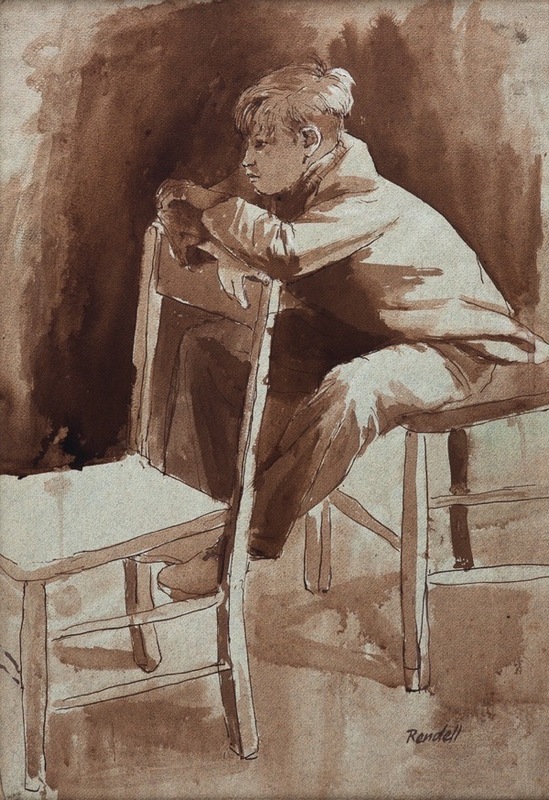 He became my friend and he followed my work when I left art school, and he used to write to me over the years. I never earned any money as an artist, I had not got the gift of making money, I would always belittle my work. I do a picture and think, ‘That’s quite good’ but then I would think ‘That bit there needs changing.’ I remember doing a painting of lemons, I was quite pleased with it. I did it in my father’s bank which was open on Sunday, so I put all these lemons on the counter with a cauliflower and I painted them. I did not think much of it yet years after I put it in an exhibition and people said, ‘You’re brilliant!’ It means a lot when you are eighteen but there you are, what does it matter now? I enjoyed doing it. I tried getting my work exhibited by galleries but it was an awful fag, I made a living by doing odd jobs. I travelled a lot and I read a terrific amount because I was too shy to talk to people – and that was a good thing because I got a wide vocabulary. I travelled all over Italy, you did not hitch then but I got lifts somehow and I used to draw in cafes. I found that this was terribly popular and I could draw because of my marvellous tuition. It was wonderful. When I first went to Florence, somebody sent me there and said, ‘Try and make a go of it!’ I did not have any money, if I had a few quid I was surprised. I shared a house with extraordinary people. One or two very wealthy, one or two officers in the army, a Spanish girl, various other people, and me. I used to go out and draw in the evening because I love watching Italian life outdoors. Those drawings are scattered all over Italy. 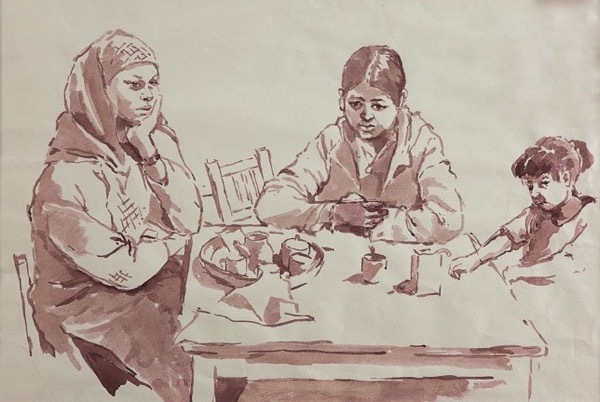 It was fun, I loved drawing ordinary people sitting around chatting. They did not mind where I came from. I loved it. I would love to be Italian. Eventually, I came to the East End and I had to go round awful schools. I was not used to these East End types of all nationalities but I stuck it out – I think I must had a bit of character – and I eventually got a job at Harry Gosling School where they had a remarkable headmistress. She was astonishing, she became my best friend instantly. She was called Sybil Mary Parry. She got me going on life really. She got some brilliant results. She was a state scholar, which means she was the best eighteen year old taking exams in the county. She was very intelligent and she had a big clientele of boyfriends, who all played rugby for Wales. I can still hear here shrieking across the room when the television was on and Wales were playing. The school was in a very poor part of the East End and I could see that for the children it was life or death to get a good education, and she saw to it that they did. She was very eccentric, she would talk to people all the time and even go round to the betting shop herself to put her ten bob on the Derby. Sibyl used to keep a bottle of sherry in her filing cabinet. She was a marvellous character. She is not forgotten. Orovida Pissarro, Camille Pissarro’s granddaughter. 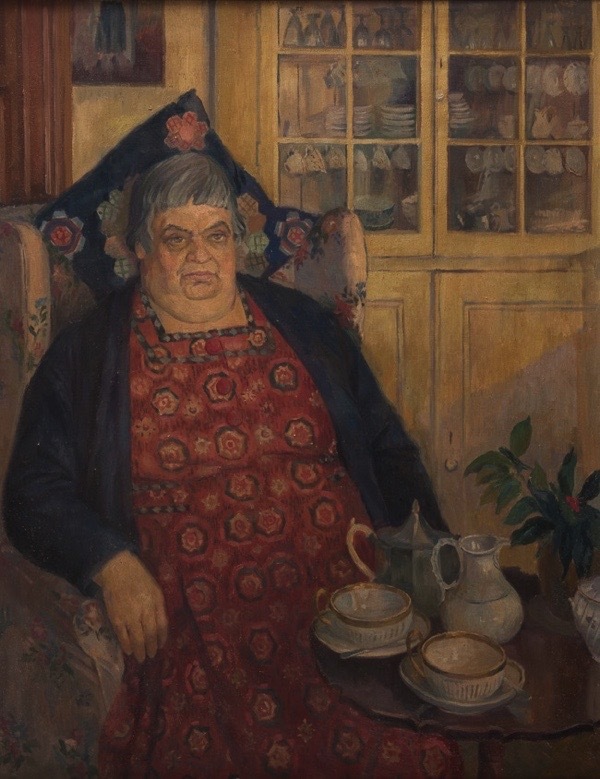 “I met her through Carel Weight whom I encountered in Warwick Gardens, he had a studio down the road. One day, I was looking outside a junk shop in the Earl’s Court Rd and he asked me, ‘What are you wanting?’ I said, ‘I’m going out to buy a chair because I have a quartet coming to practice in my studio and I have not got four chairs.’ He said, ‘Come with me, I can give you a chair.’ So he took me to his house and we became friends. A life well lived is the impression that shines out here. She seems, forthright, formidable and clearly very talented. I am glad you helped bring her some recognition. What wonderful memories of all those people she has drawn. 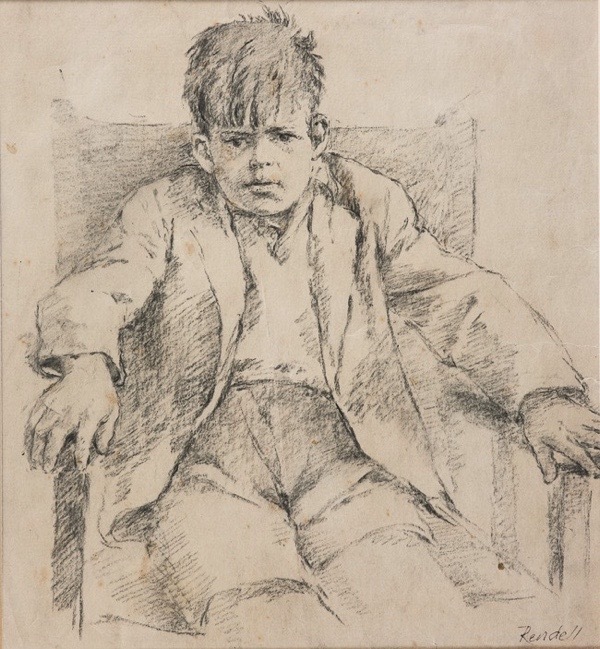 The portraits of the children are so sensitively don. I was so interested to read about Orovida as I have an etching of hers that I bought at an auction, it’s of a tiger chasing a small deer, the composition is cropped rather like a Japanese print. I have a house in Italy, some years I can spend more than 6 months here. I’ll search for Rendell drawings, now. What fabulous drawings. How tragic that Ms Rendell was not acknowledged. Yes what a privilege to have met a character of that magnitude. Thank you for featuring and promoting so many excellent East End artists on your blog. What a wonderful artist, I have not seen anything she has drawn or painted and not loved it instantly. Deserved much more recognition. Also seems a very warm and lovely person. Will be sadly missed. Fabulous post. A great tribute to a fascinating lady. 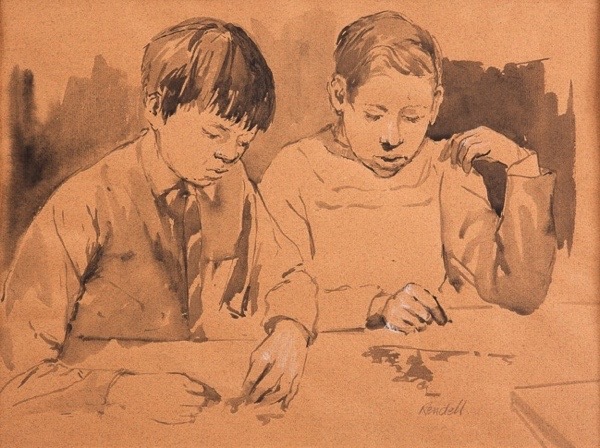 I find myself wondering when Ms Pissaro was in Redcliffe Gdns – I was in Redcliffe Rd in the ’70′s and ’80′s and that area had been where a lot of artists lived during the war and for ages after. I wonder if Rendell was known to Joan Wyndham who wrote about life in that quarter during the war too. So many great artists who are never seen by the general public. Thanks you for bringing so many of them to our attention. RIP Dorothy. Wonderful. Thank you. Best blog on the web. So pleased your efforts got her some recognition in the end. Marvellous artist & human being. 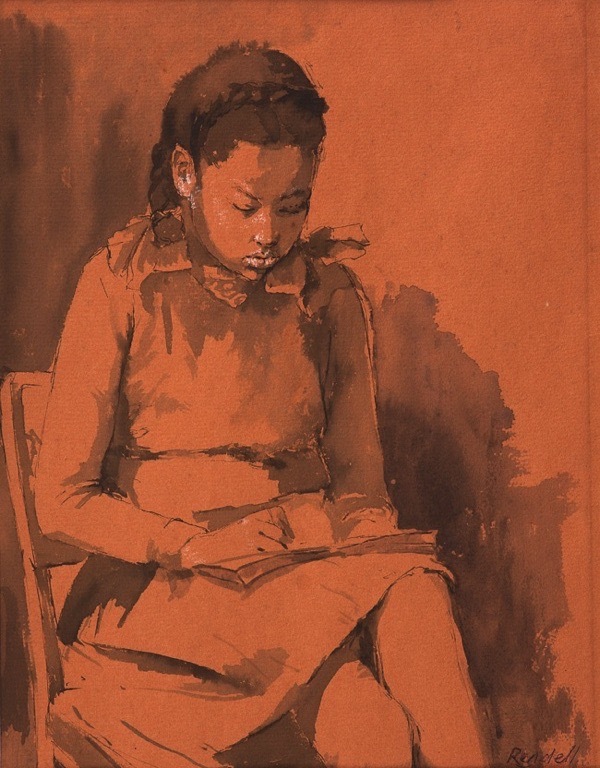 So sad to learn of the passing away of my wonderful Art Teacher at the Harry Gosling Primary school, Henriques Street in the East End. Dorothy inspired me to appreciate art which has stayed with me throughout my life. I always remember her taking us on a visit to the National Gallery in London as a young pupil at the school. Whenever I have the opportunity, I always make a ‘pilgrimage’ to the gallery and spend a long time in front of the historic canvasses. 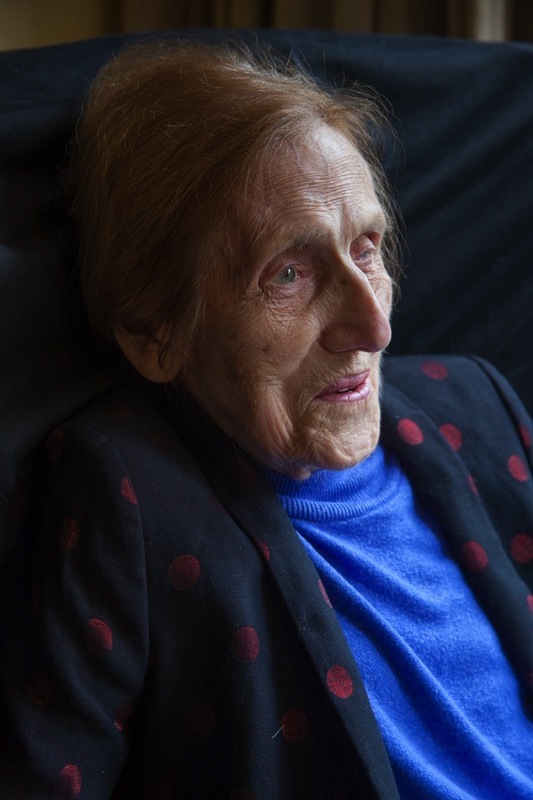 I was fortunate to visit her recently and was amazed by her recollection of life and times at the Harry Gosling school and how she could remember details of individual pupils and how they had achieved so much in later life. She would also remind of other wonderful teachers at the school including the Head Mistress Sybil Parry and my class teacher, Joan Kelk. So long Dorothy. May you rest in peace. 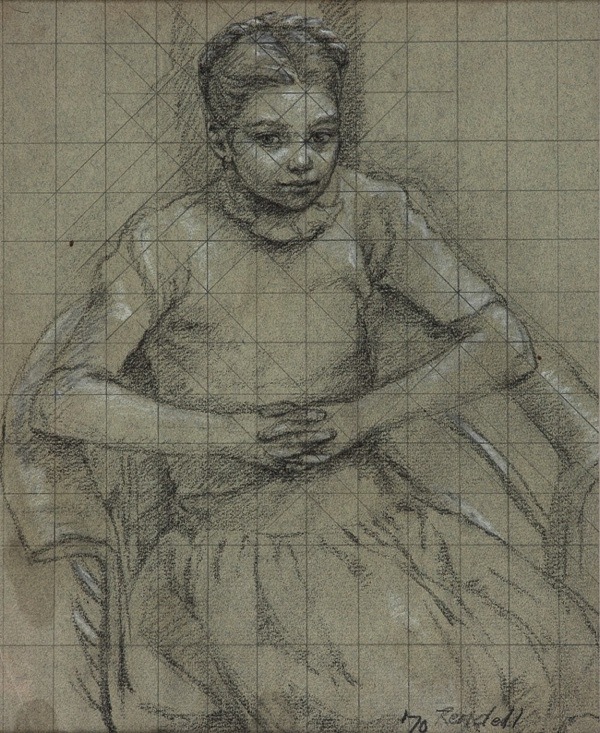 A wonderful Artist has gone forever — Dorothy Rendell (1924-2018) — R.I.P. So sad this wonderful artist did not get the recognition she deserved. I do hope her work will not now slip into obscurity. Thank you GA for bringing her to our attention. A life well lived indeed. seemed like a good person and a very good artist. So long. Really lovely. Part of me thinks-Everyone has a story. And then my thoughts wander to-these times we are in will not give to us a story so deep and rich. Time will tell. I appreciated her art. Thank you. Truly wonderful how you bring wrongly forgotten and wrongly unheralded figures to our attention. Wonderful and very moving. What a tale, spirit and talent. 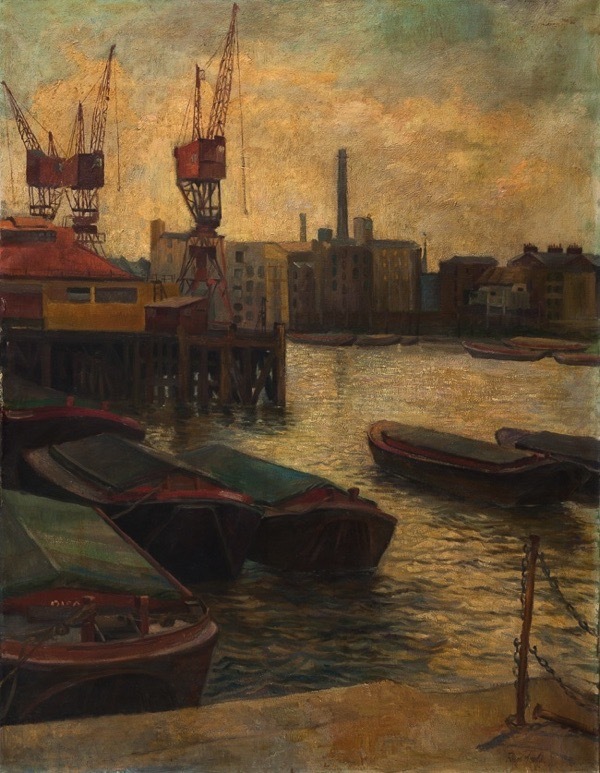 I grew up opposite Dorothy in Mile End place and I am sad to say I had no idea that she was such a gifted artist. Which is a shame since we were such a creative family we would have enjoyed seeing her work. As a child she seemed a very other worldly personality. Someone who looked and spoke like she came from another age. She was very private and very well spoken. She drew out her words in a way I had never heard anyone do. She lived in her cottage with another lady and they both had a real edwardian feel about them. I remember one day my friend Ayse and I accidentally kicked a ball into their garden. They were a bit cross and they both came out and demonstrated how to play catch which we thought was hilarious. I think she disapproved of unruly children. I wish I had spoken to ber more and asked her about her work and her life. Such beautiful work….Greatly saddens me and more than frustrating the injustices of life…the art world, although of course the ‘art world’ has nothing to do with Art – Dorothy was certainly to do with Art. Thank you for her discovery. Great interview with a fascinating subject. And pleasing that you gained some belated recognition for her work. Must be bittersweet to be praised after so long.